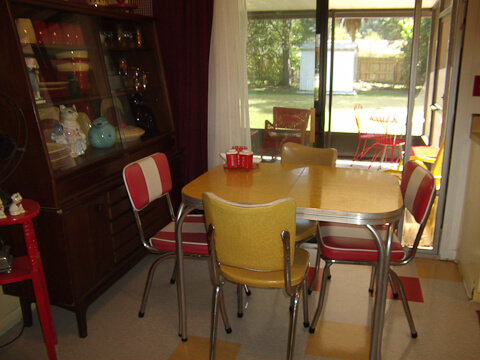 Jana has a sunny, happy story about Retro Renovating her sunny, happy yellow kitchen. My husband taught me, “Good. Fast. Cheap. 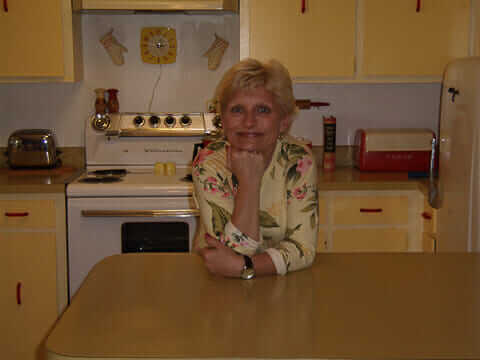 Pick Any Two.” Jana had time… so she was able to finish the kitchen Good and Cheap. For $1,268, to be exact. And that includes new flooring, a vintage Sears Coldspot refrigerator, and the gorgeous 30″ vintage Westinghouse stove peeking out from behind her. 30″ vintage stoves = a rarity. Read on for her story, resources, and lots more photos. I have received so much inspiration, information and so many good ideas from your blog and the family of readers that I thought I would share my story. I became a first time homeowner late in life (in my mid 40’s), so my journey into retro wonderland has been a labor of love. It took me a year of house hunting, and my 1969 mid century modest ranch actually found me. When my realtor was showing me a house (that I was thoroughly unimpressed with, because the inside had been totally updated and it had lost all of its charm)… there came a knock at the door. The neighbor across the street asked my realtor if she could talk to her about listing their house because she and her husband had been trying to sell it on their own with little luck. I glanced across the street at the house with the For Sale by Owner sign and was immediately intrigued. The woman asked if we would like to come in and see the house on the inside — my realtor was hesitant, but my curiosity led the way and we were marching across the street before we knew it. I am a college teacher who specializes in working with at risk students, so I am used to spotting possibilities and eyeing that student who is a diamond in the rough that will shine with some attention and TLC. The house was no different. The good news was that all of the fixtures and all of the cabinets were original along with the flooring, wood paneling and the 1969 Coldspot Avocado refrigerator. The bad news was that the roof, heating/air were 10 plus years old, the windows were original single pane with no screens and the interior was in pretty rough shape. Being a renter most of my life, I was used to living in “cosmetically challenged” older homes, so I was not immediately put off by the condition of the interior. It was a small, solid brick/block ranch with a carport I really wasn’t put off when I heard the price they were asking and that day I made an offer, it was accepted and 45 days later I closed. I was now a homeowner! That was 10 years ago and during that time, I have been steadily working on one project a year as my pocketbook would allow me. I decided to start my list with some of the “big stuff”. The first major renovation I did was to rip up the smelly RED carpeting that was in every room except the kitchen, laundry room and bathrooms. (Yes, it was that color of red that reminded you of Miss Kitty’s Saloon and smelled like it too). Before I moved into the house, myself and 3 friends ripped up the carpenting, scraped the cement slab and put down Bruce oak tongue’n’groove flooring. (real wood, not laminate). I found a great deal at Home Depot on the flooring and already had the tools and the mitre saw. My dad was a DIY guru, so growing up, he taught my sister and I many valuable home maintenance/remodeling skills when we used to help him with his “puttering” projects. PROJECT NOTE: I chose the “peel and stick” kind of flooring because I didn’t want to mess with the adhesive. It is very easy to work with, but it is also very time consuming. The peel and stick stuck just fine, however, because the flooring was a lock in tongue and groove, it took three times longer than I anticipated and it needed to be a two person job to lay each board to make sure it laid & adhered evenly. I had to use extra vacation days from work to finish the job. That took an exhausting week of 14 hour days, but it looks great now that it is done . During the next few years, the roof was replaced (after damage from 3 hurricanes in 6 weeks), new energy efficient windows were installed (with screens), and now I’m working on the heating/ac. Now that a lot of the major issues were addressed, it was time to address the interior and start with the kitchen. Not having sufficient funds for a major re-do, I decided to focus on the details and work with what I had. I wanted to re create a kitchen that reminded me of our home when I was growing up. My parents were very thrifty and nothing ever got thrown away, so we grew up with an eclectic mixture of furniture and decor from the 40’s 50’s 60’s and 70’s. As an adult, I find that I really like the interest and variety of mixing the decades. The house was small and the kitchen cabinets were a dark walnut veneer that had peeled off in some places and was chewed off by the previous owner’s Jack Russell in others. I wanted to lighten up the kitchen, so I filled in the chew spots with wood putty, sanded them down and painted the cabinets a bright yellow to coordinate with the harvest gold laminate counter top. The next decision was what hardware to use? I needed 36 pulls so I figured vintage was out of the question. I looked at several reproduction lines, but they were pricey. Did I say vintage was out of the question? I found some cool, vintage NOS red bakelite handles from the restored hardware division of Rejuvenation. The pulls were from the 30’s, but they are the bomb! I wanted some curved half shelves for the cabinets and couldn’t find any, so I went to the craft store and found some unfinished wood pieces and made some. I painted them red to contrast with the yellow cabinets. The red checked wallpaper was glued directly to the sheetrock, so I didn’t want to take it off. I saw a cute 1940’s wallpaper border on Ebay and had the winning bid. I had never worked with wall paper paste before, but it wasn’t too messy to put up the border. 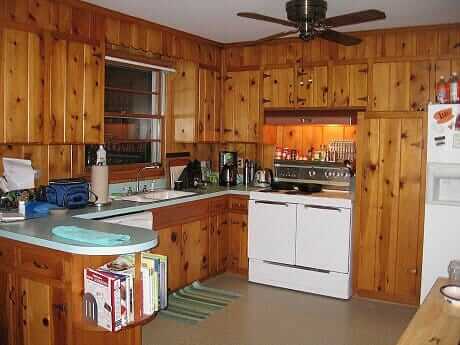 The next problem was what to do about the north wall of the kitchen which was covered in dark walnut paneling. It was scratched, had lots of nail holes and was well… dark. Not being a fan of paneling, I decided to paint it yellow to coordinate with the cabinets. I wasn’t sure about painting paneling, but after doing some research and seeing pictures, I gathered my courage and painted the wall yellow with the left over paint from the cabinets. It turned out great! 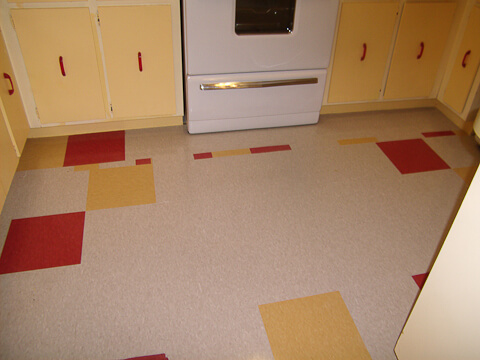 I then decided to replace the original vinyl tile flooring. It was very pitted, scratched, stained and generally gross. I had most of the kitchen floor covered with rugs so I could hide it. What to do? I poured over the flooring section of the blog and just couldn’t decide. Colors? Patterns? Styles? I really liked the Autumn Haze in Pam’s kitchen, but I decided to use the traditional Armstrong VCT flooring that I ordered from Lowe’s. It was more inexpensive with easier availability. My childhood house had the same type of tile only in a dark green, so I was comfortable with that decision. Now to agonize over colors. Single, two combo or a trio? 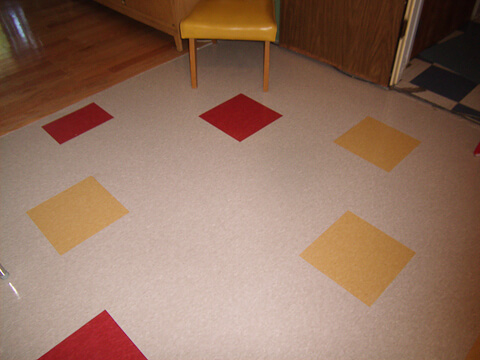 After going through the entire Armstrong catalog, I decided on 3 colors for the floor- red, yellow and bone. Here we go again… pattern? I was not sure whether I wanted a structured checkerboard or a random pattern. Thank you reader Janice! After seeing pictures of her pretty Granny Smith and Autumn Haze random floor pattern, I went with the random placement of the colored tiles. The hardest part of the project was removing the old flooring. SAFETY NOTE: For those who live in humid climates, I recommend wearing a breathing mask and gloves. When I pulled up the old vinyl flooring tiles, I encountered several pockets of nasty black mold. I worked on the floor each Sunday afternoon and it was finished (literally) in a month of Sundays! THRIFTY MAINTENANCE NOTE: recently, I was fortunate to find a vintage Regina floor polisher/scrubber/buffer at an estate sale. Before that, I didn’t want to pay someone to clean and polish the floor and I didn’t have 300.00 for a floor buffer, so I improvised. I found a $25.00 car wax buffer at Wal-Mart. Yes, you have to be on your knees or sit to buff/polish the floor, but it does just fine. It is also handy to spot buff after wiping up spills and small areas that you have mopped. I had a contractor friend of mine come over and help replace the kitchen sink and fixtures. Previously, there had been a shallow (very scratched) stainless steel sink. Apparently the sink was too shallow because when he removed it, the entire interior back side of the cabinet under the backsplash was rotted due to water spilling over the back lip of the sink. He was able to splice in some new wood support pieces to the area under the backsplash to support the sink. I really did not have the resources to replace all of the cabinets and counters. At that time, I was unaware of Pam’s posting about the Kohler sinks and Hudee rings, so I went with a plain white enamel double bowl from Home Depot. The Kohler and Hudee ring are still a possibility, but for a future date. I then decided to focus on some functional details for the decor. 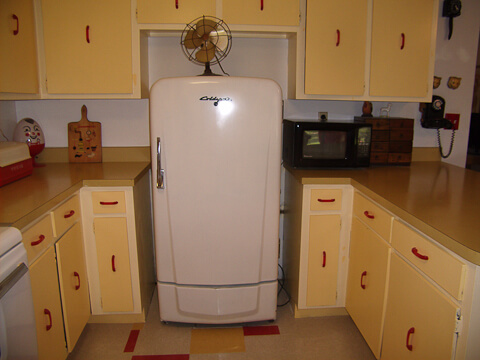 I was fortunate to find a 1949 Coldspot refrigerator in the classifieds that had been rewired and repainted. The owner was moving and wanted to get rid of it in a hurry, so it was very cheap. I kept my larger 1969 Coldspot and moved it into the utility room. It is interesting to have different year models of the same brand. I found my mid century china cabinet at a local thrift shop. THRIFT NOTE: My china cabinet did not cost a penny – I traded my old china cabinet for the one I have now. I didn’t even have to pay for delivery because the thrift shop considered my old china cabinet as a donation, so they delivered the one I wanted and picked up the donated one I didn’t. I found the yellow cracked ice chrome table and chairs on CL and again, did not hesitate to drive the 60 miles to go get it. This was very similar to the set we had when I was a kid, but ours was green cracked ice. I wanted a vintage stove and you know what they say… size matters. I found several that I liked, but they all were too big – 42-52 inches with the dutch oven. With the built in cabinets, I needed a 30″ size. As I discovered, this size is much more rare and harder to find. After months of previewing auctions, scouring thrift stores, used appliance stores and local listings, I was very excited to find one on CL. Didn’t matter it was 75 miles away, had to have it!!! 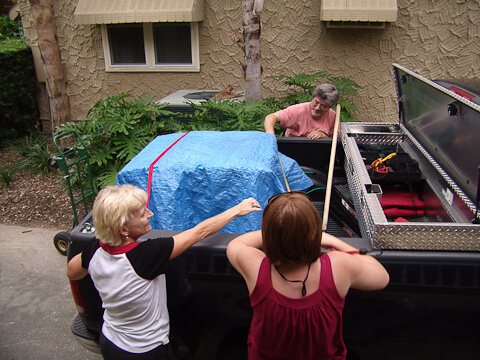 Made the call, my friends and I grabbed the tarps and bungees and jumped into the truck. 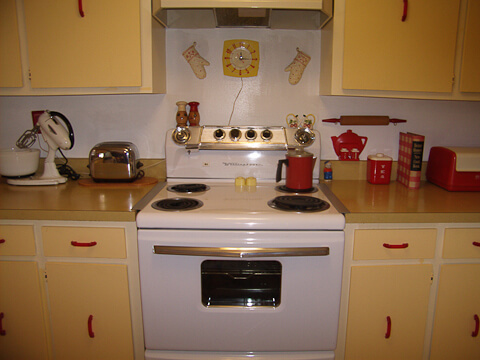 The stove was a 1955 Westinghouse electric model FJ and had been sitting in a shed for 3 years. It was the right price, so I grabbed it not knowing if it was in working order. It took 3 days and 3 gallons of degreaser to clean it up- I took off every part that had a screw in it and cleaned like a madwoman. After the dirt, grease, mouse doo and birdsnests were cleaned out, it didn’t look half bad. All of the working parts were present except two knobs and later I found replacements on Ebay. SAFETY NOTE: I did call a home appliance repair person to come out and thoroughly inspect the wiring and parts before I ever attempted to plug in the stove. I was pleasantly surprised when Joyce the repair person said that the wiring was in good shape and did not need to be replaced. We plugged it in and tested all the parts and everything worked! “Westie” is now the queen of the kitchen and cooks food better than I do. In keeping with my desire for authenticity, I now turned to lighting. Living in Florida, ceiling fans are a must and I already had one mounted above the dining area to provide cross ventilation between the patio and front rooms. I found the cutest MCM red striped ceiling fan shades at Rejuvenation. I also had a second ceiling light mounted over by the stove. This was a generic, bland replacement light. 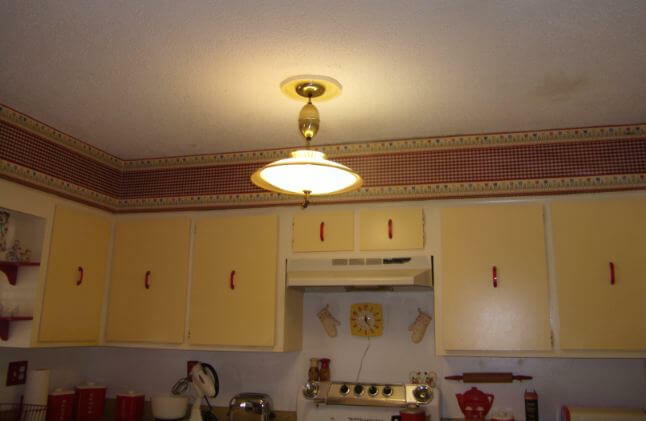 I saw the wonderful “flying saucer” pull down light in Pam’s kitchen. Wow! Just like we had when I was growing up — gotta have one! Looked on Ebay, but final auction prices were a bit out of my range, so I kept waiting and checking. The Lighting Gods rewarded me for my patience because I found one that apparently did not have a lot of interest because I got it for a song! I don’t know what style or manufacturer it is, but it wired right in and works great. To finish out the functional decor details of the kitchen, I went flea marketing. I found an old jukebox telephone that had been converted to modern phone jack plug in status. This is just like the phone that we had in our kitchen when I was a kid. (I used to sneak into the kitchen and listen to the neighbors on the party line). I also purchased a NOS electric Sunbeam toaster (again, same model as when I was a kid), 2 old fans, and an old Traveller model AM radio all in working order. My favorite vintage appliance was not purchased, but handed down to me from my mother. It is the 1949 Hamilton Beach mixer (pictured on the counter). This mixer was the first item my mother went out and bought for her dowry after my dad asked her to marry him. It has been the workhorse of our family mixing up countless batches of pancakes, Christmas baked goods and of course, decades of birthday cakes. Every time I use it I think of the fun times I had in the kitchen with my mom preparing some kind of yummy baked goodie. It is the treasure of my kitchen. To finish out the decor, I needed some canisters. Hooray for Ebay! I found a set of red Lustroware canisters and breadbox and won them with a low bid. Last but not least, need a clock. Again, Ebay to the rescue! After adding up the receipts for materials, fixtures, appliances, furniture and decor items, my grand total is $1,268.00 for my kitchen retro re do. It took quite awhile, but being the thrift queen that I am, I was really in no hurry. 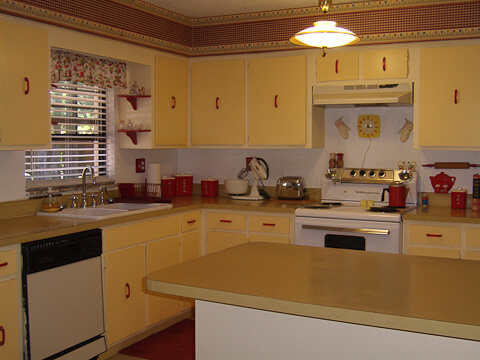 I worked on the kitchen one project at a time over the last 3 years, but it is finally finished and really models the bright, cheery 1950’s kitchen that I grew up with in my childhood home in Indiana. I love my kitchen and the warm memories it brings with it. Thanks for letting me share. Jana, I am ready to head right over for a cuppa. Your kitchen is so charming and friendly — and gosh, you made it so easy for me to write this one up. In particular, I love how you worked with the existing harvest gold countertops — waste not, want not — but still were able to morph over to the sunny (rather than muddy) side of yellow…. I love the touch of adding the vintage wallpaper edging over the existing checkerboard…. I love your improvised, red knick-knack shelves flanking the sink… and Oh, and what is Not To Like about your Westie? This kitchen is like a party that was waiting for YOU to send out the invites. You go, girl! Thank you. This is a year and some months after the initial post, but I’m new to the site and recently purchased a 1954 house that is in dire need of repairs and restoration. I was trying to get a color palette that fused my love of greens, splashes of red and the wonderful gold print wallpaper . I truly adore Jana’s kitchen. It has inspired me. I just hope my kitchen comes out half as well as hers. Hello, beautiful work, I recently purchased the same coldspot. Could u tell me what year was it made in? Was it 1955 ? I’m having a hard time finding it anywhere and did u ever find a maual for it ?